Making a successful feature length cartoon is a hard nut to crack. For every animated hit, a dozen sink without trace, relegated to being stuck on the DVD player just to keep the kids quiet on a wet afternoon. Fortunately, though clearly no Oscar winner, neither is The Nut Job – directed by Peter Lepeniotis and featuring the voice talents of Will Arnett, Brendan Fraser and Liam Neeson – a dud. Surly (Arnett) the squirrel has been banished from the rodent community in the inner-city park where he lives. Desperate to find food to survive on the mean city streets Surly, and his rat friend Buddy (Robert Tinkler), discover heaven – the seemingly abandoned Nut Shop. Unknown to them however the shop is cover for a group of desperate bank robbers, who are about to pull of an enormous bank robbery, causing havoc for anyone – animal or human – who gets in their way. The requirements are here for a potential hit – goofy characters, beautifully realised animation and a clever use of recognisable contemporary hit music which fits seamlessly with the overall production. A feeling of 1940s ‘American Noir’ permeates the film, embodied in the cityscape where the rodent friends find themselves pitted against all kinds of human and mechanical adversaries. This is also where one of the film’s best characters – head robber Percy ‘King’ Dimplewade’s (Stephen Lang) girlfriend Lana (Sarah Gadon) – appears. A more lifelike embodiment of Hollywood screen siren Lana Turner would be hard to find, and Lana’s character holds everyone’s (both the animated cast’s and the audience’s) attention when she appears. Yet, saying that, something is missing. The storyline – though frantic and offering plenty of opportunity for the usual slapstick jokes – is probably the film’s weakest aspect. One of the best things about films from Disney – the daddy of all animated film producers – is the strength of their plots. Even their films based on well known fairytales rework the stories in such a way that they seldom drag for what can often be quite long running times for a cartoon. The premise for The Nut Job however is limited: it’s eighty five minute running time could have seen cuts without loosing anything whilst tightening its overall impact. Cartoon features are frequently touted month’s before release, and the films when they eventually hit cinemas are not always all they were cracked up to be. 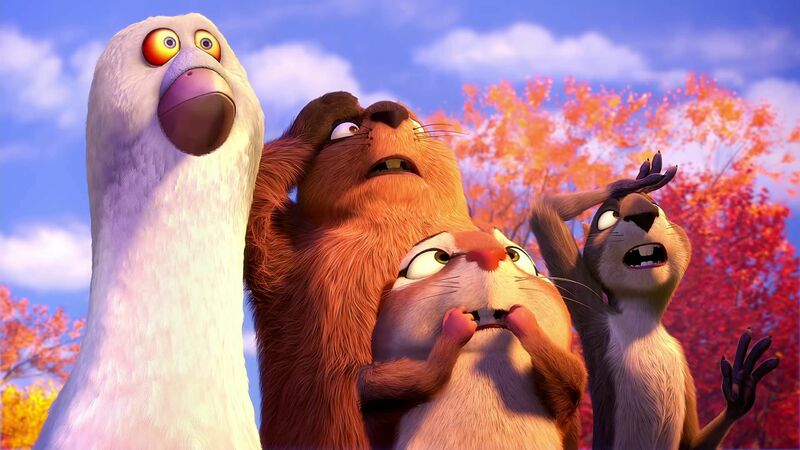 The Nut Job appears to have had a reasonably low profile release, and as such expectations for its success have not been overestimated, meaning the result is a pleasant – if untaxing – surprise.